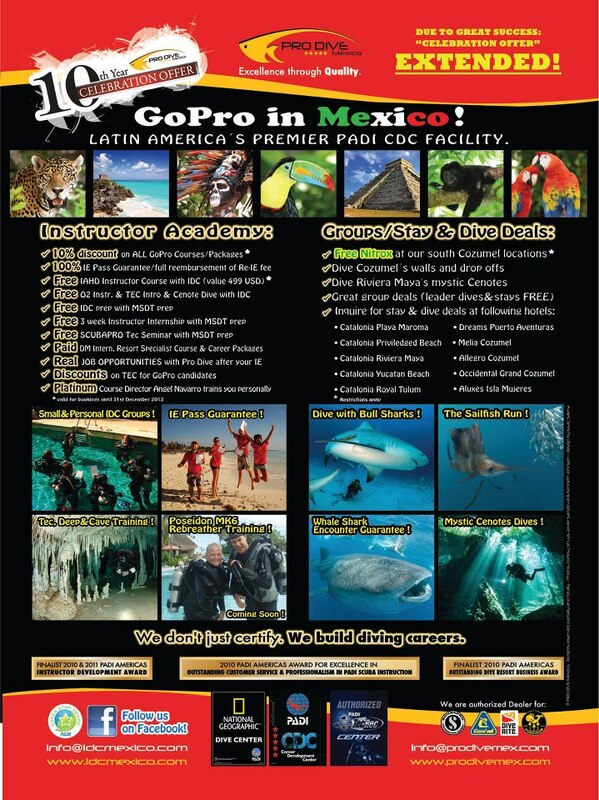 Pro Dive Mexico PADI Career Development Center: “10th year celebration Offer” EXTENDED!! “10th year celebration Offer” EXTENDED!! Dear friends, we have had an overwhelming response to the last 3 Instructor Development Courses this year, being run by our new Platinum Course Director Angel Navarro. At this point, we only have a handful of places left on our October and November courses. ND the 10% discount promotion for all reservations made by the 31st december 2012! The 10% special discount therefore will be continued to be available on all GoPro Packages, single programs such as IDC and more, and even on PADI TEC REC programs! For more information on our Promo, GoPro packages, IDC training programs and internships please visit our website www.idcmexico.com or contact our Course Director at angel@prodivemex.com .